Let’s talk about what happens when kids are stuck inside for too long because they don’t have a cool toy like a cubby house in their backyard. It happens, all too often in some cases, that kids will not get enough outside time. This is time that they need to develop and grow in a healthy manner. But for any number of reasons, they don’t get out. It really does start out innocently. It rains one day, they get hooked on a movie marathon or video game for hours, they spend all day in school and come home to lay on the couch watching cartoons, etc. All indoor activities, if repeated often, can really be a detriment to your child’s health. Now, think back to those days that your kids stay inside all day playing video games or watching television. How are they? Moody? Bored? Yes. That is when you will have the most problems with your child, when they are moody and bored. But there is a simple fix for that. Get them playing outside in the fresh air. Really, it is just that simple. When children are outside, they get rid of penned up energy and work up some of those happy endorphins. They work out their muscles , helping them to develop and grow. And an added plus, they tired themselves out, getting themselves ready for a restful sleep. And what can you do to get your kids outside so they can take advantage of all it’s healthy benefits? You can provide fun things for them to do while they are out there, like a fun cubby house or fort, swing sets or a combination of both. We hear it all the time, our customers tell us they used to have to beg their kids to go outside. But, now that they have a cubby house or fort in their backyard, they have to beg their kids to come back inside for dinner or bedtime. It’s true. 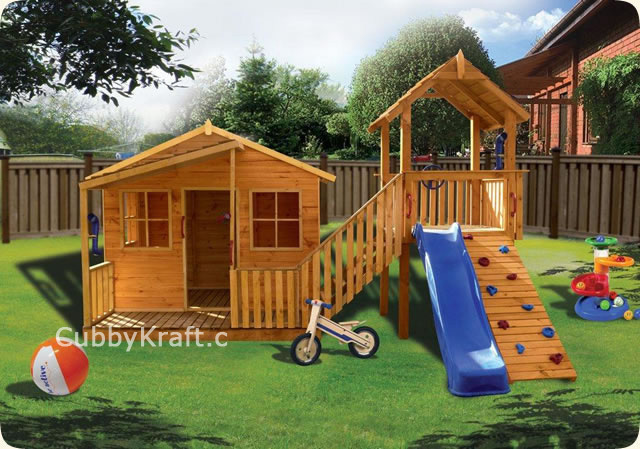 Kids love having adventures in their cubby house and fort.